America’s #1 gas grill brand Char-Broil® is launching an all star line-up of BBQ models for 2019, all of which combine cutting-edge innovation, top performance and fantastic design. Stars of the new range are the new All-Star portable BBQ, available in gas or electric models; a new Gas2Coal hybrid BBQ with 4 burners; and a Professional ‘Double Header’ enabling fish, meat or vegetables to be grilled completely separately. All of the new products feature Char-Broil’s innovative TRU-Infrared cooking technology to give 50% juicier results and even distribution of heat without flare-ups. The new additions complement Char-Broil’s existing UK product line-up which includes: the Kamander charcoal grill, a portable and rugged Grill2Go, a digital smoker, and the Big Easy smoker/roaster/grill all-in-one. The 2019 range now offers a product to suit every type of garden, home and outdoor lifestyle. Innovation at the heart of everything - Char-Broil brought one of the first charcoal grills to market in 1948, and in the years since has continuously delivered innovation - 'Infrared' is one of the most well-known of Char-Broil’s unique technologies, because it has helped revolutionise BBQ cooking by giving up to 50% juicier results, and a perfectly even distribution of heat without any flare-ups. For those who only have a balcony or small garden but want the performance of a premium grill, the new Char-Broil All-Star BBQ is the ultimate versatile and portable solution. Available in either gas or electric models, it can either be placed in its stand - with foldable side shelves for extra workspace - or it can be detached from the stand to place on a table-top. 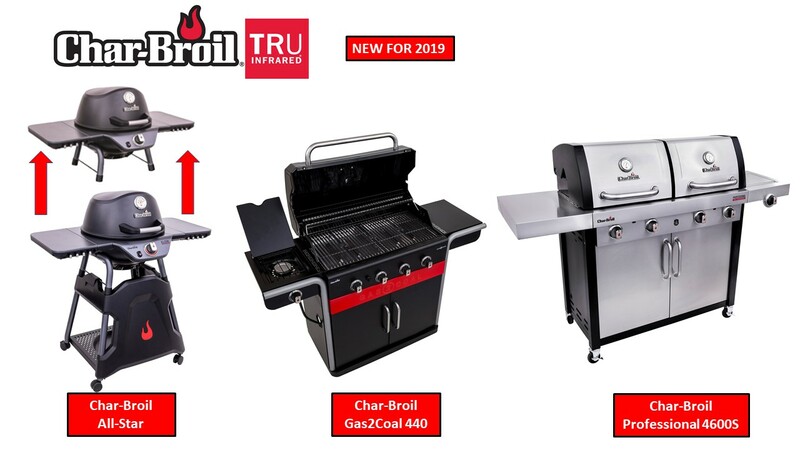 Cast iron grill grates make it durable, rust resistant and easy to clean, and the All-Star delivers the trademark Char-Broil TRU-Infrared cooking performance using indirect infrared heat to evenly cook producing 50% juicier results every time. As well as delivering a superior cooking performance on the 1,600 cm2 cooking area, the All-Star offers distinctive, premium design and durability. It has a cast-aluminium lid with a lid-mounted temperature gauge and a porcelain enamelled firebox to deliver a perfect, controlled BBQ experience. The grill can be separated from its cart by opening the two lockers on each side; the pocket handles facilitate transport of the grill. Our research shows that 25% of grill users transport their grill occasionally to friends or on holiday. The All-Star comes with built-in tool hooks; a mid-cart accessory system (extra shelf, paper towel dispenser, small trash bin) and is rotisserie-capable. The All-Star also has an innovative GearTrax accessory that turns it from a low-level portable BBQ to full height wheeled cart, making it easy to manoeuvre. Why choose between gas or charcoal when there is a grill that can do both? And can even do both at the same time, with the two separate charcoal trays. The new Char-Broil 440 converts from gas to charcoal in less than 60 seconds and without requiring any tools. Available in black painted steel, the Gas2Coal has 4 stainless steel burners and Surefire ignition so that you’re ready to cook at the touch of a button. A lid-mounted temperature gauge helps you monitor heat and an additional side burner is available to warm up side dishes or cook sauces whilst a warming rack keeps food ready to eat as you finish off serving. A removable grease tray and high quality cast-iron grill plates make it easy to clean. The barbecue is mounted on large wheels for easy mobility. The new Professional 4600 has 2 separate fireboxes and lids for maximum cooking versatility. Which makes it ideal if you want to cook fish on one side and meat on the other, or keep one side completely vegetarian. The hood is made from double-hardened cold-rolled steel, giving a quality look and feel. There are 4 stainless steel burners, and burner ignition is at the touch of a button with Surefire® electronic ignition. Two lid-mounted temperature gauges enable you to keep track of your perfect grilling; and a side burner will warm up side dishes to accompany the main event. The model also comes with a warming rack; cast iron grill grates which are long-lasting, rust-resistant and easy to clean; and two large stainless-steel doors at the front. The 4600 features a single piece deep drawn firebox for higher durability, and locking castors for more mobility and stability.